이화여자대학교 국제대학원과 Harvard Summer School이 공동으로 주관하는 “2019 Ewha-Harvard Summer School Program"에 참여할 학부 학생들을 모집합니다. 2019년 프로그램은 'North Korea'를 주제로, 정치학 전문가인 Harvard University의 John Park 교수님의 "Thinking Out of the Black Box_Exporing New Insights into North Korea" 수업이 진행됩니다. 하버드 대학교와 이화여자대학교 및 교류대학의 학생들이 함께 수업을 듣고, DMZ, 청와대, 하나원 등 수업과 관련된 곳을 함께 답사할 예정입니다. 프로그램에 대한 설명회를 개최하오니, 아래 내용을 참고하시어, 관심 있는 학생들의 많은 참여 바랍니다. 하버드 대학교 John Park 교수의, “Thinking Out of the Black Box_Exploring New Insights into North Korea "을 주제로 하는 강의. 강의 외에도 필드 트립과 여행 (2박3일 또는 3박4일), 영화 관람 및 토론, 관련 전문가와의 대화등 다양한 활동을 진행함. 서류심사와 영어면접을 거쳐 최종 선발된 학생에 한하여 수강 가능함. 본 프로그램은 본교 여름 계절학기 교양과목(3학점, 졸업이수학점으로 포함됨)으로 개설됨. 프로그램을 성공적으로 이수한 학생들에게는 Harvard Summer School과 이화여자대학교 국제대학원에서 각각 수료증이 주어짐. ▶ 지원 자격: 본 프로그램에 관심 있는 본교 및 국내 계절학기 학점교류 대학 소속 학부생(2019년 8월 졸업예정자 제외)이라면 누구나 지원 가능. 남학생도 지원 가능함. 2. 영문에세이 주제는 지원서 하단을 참고하여, 새로운 문서파일로 작성 및 제출 부탁드립니다. 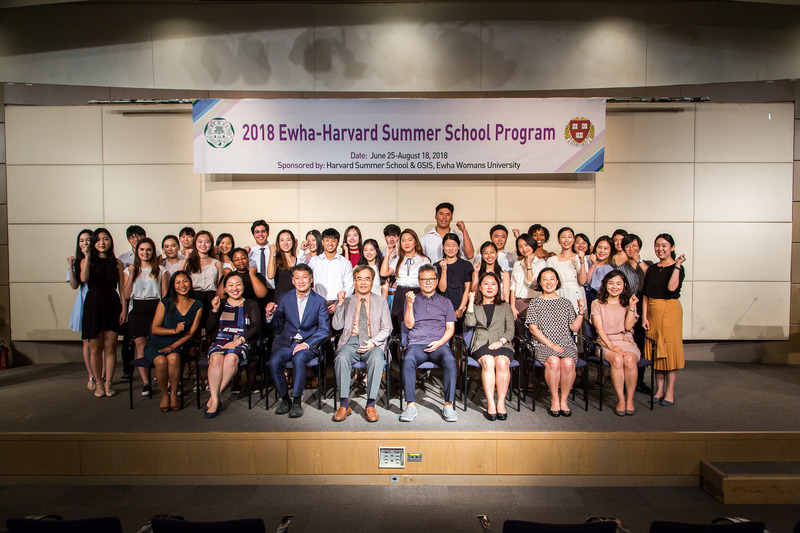 In partnership with the Harvard Summer School and the Korea Institute of Harvard University, the Graduate School of International Studies (GSIS) at Ewha has developed the Ewha-Harvard Summer School Program (EHSSP) since 2006. 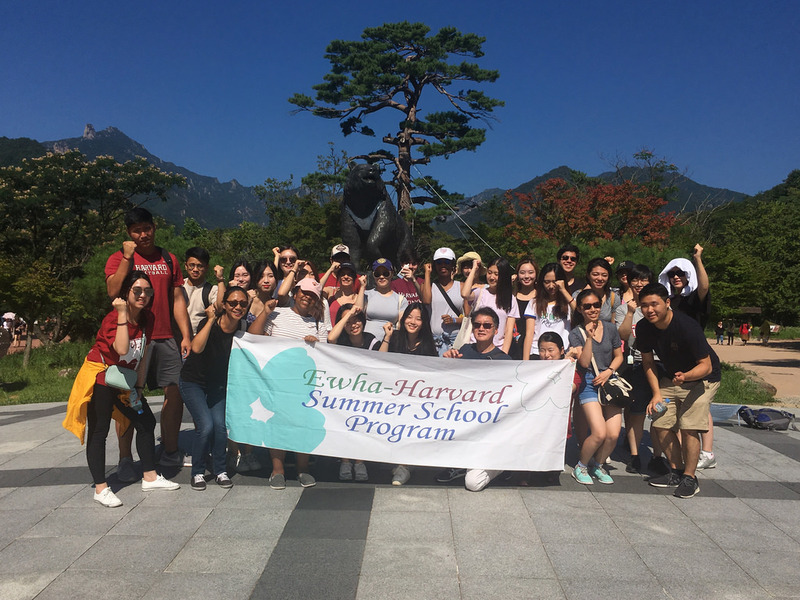 This is an international summer program that provides both Harvard and Ewha students with an opportunity to build mutual friendships and learn about different aspects of Korean culture and history. In order to encourage participating students to experience Korea, the program focuses on various aspects of Korea’s culture and history, and provides rich in-class discussions along with many field trips to culturally and historically significant sites. Since 2006, the EHSSP has offered a substantive course on one key aspect of Korean culture and history, and for Harvard students a Korean language course. The substantive course has changed every year to take advantage of new trends and interests about Korean culture and history ranging from poetry, North-South Korea relations, archaeology, cities and culture, visual culture including cinema and film-making, societal issues, and etc. The program celebrated its tenth anniversary in 2015, and will continue to flourish in 2019. In 2019, the Program will offer a course on North Korea with Professor John Park of the Harvard University, and Korean language classes with Professor Hi-Sun Kim of Harvard University with Ewha’s Professors. The North Korea class will study new insights into the North Korean regime through the lens of recent research interviews with defectors. Harvard students will take a Korean language class suited to their individual level of Korean language proficiency. All Harvard and Ewha students will live in the Ewha dormitory and work together as language partners. This program is open to Ewha’s and Harvard’s students and to male and female students. Ewha invites students from other Korean universities, which have credit exchange programs with Ewha. A Certificate of Completion is presented to successful students by the Harvard Summer School and the Dean of Graduate School of International Studies at Ewha Womans University. Professor John Park of Harvard University will offer an undergraduate course, “Thinking Out of The Black Box: Exploring New Insights into North Korea.” The course's objective is to hone students' critical thinking skills by exploring new insights into North Korea through the lens of recent interviews with defectors. The course focuses on deepening ties between the Workers' Party of Korea and the Communist Party of China; increasing commercialization in the elite regime circle (the 1 percent) through state trading company activities and among the masses (the 99 percent) through black markets; and how financial sanctions actually bolster North Korean procurement networks. Possible framing activities may include a tour of the Demilitarized Zone and the Panmunjom Truce Village. The course also includes a component where students can apply critical thinking skills in assessing contemporary media coverage of North Korean defectors. 3. Excursions: Every Fridays, In and out of Seoul. Places will be announced later. * Hankuk University of Foreign Studies, Korea Advanced Institute of Science and Technology (KAIST), Korea National University of Education, Korea University, Pohang University of Science and Technology, Seoul National University, SogangUniversity, SookmyungUniversity, SungkyunkwanUniversity, University of Seoul, and Yonsei University. •Freshmen need not submit transcripts, and will instead receive an additional interview question in lieu. (1)Students will be contacted individually for interviews upon document evaluation. (2)Interviews will be conducted in English. Students will be evaluated based on applicant’s interest in the program, and ability to take this course in English. 3. Fild Trips: Changdeok Palace & Jongmyo Shrine; Korean War Museum; Gyeongju; Chong-gye Stream and Nam Dae Mun; MBC (Munhwa Broadcasting Corporation) TV Studios. 4. Long Excursion to Sokcho, Gangwon-do Province. Universities with Summer Course Exchange Programs with Ewha: Hankuk University of Foreign Studies; Korea Advanced Institute of Science and Technology (KAIST); Korea National University of Education; Korea University; Pohang University of Science and Technology; Seoul National University; Sogang University; Sookmyung University; Sungkyunkwan University; University of Seoul; Yonsei University.